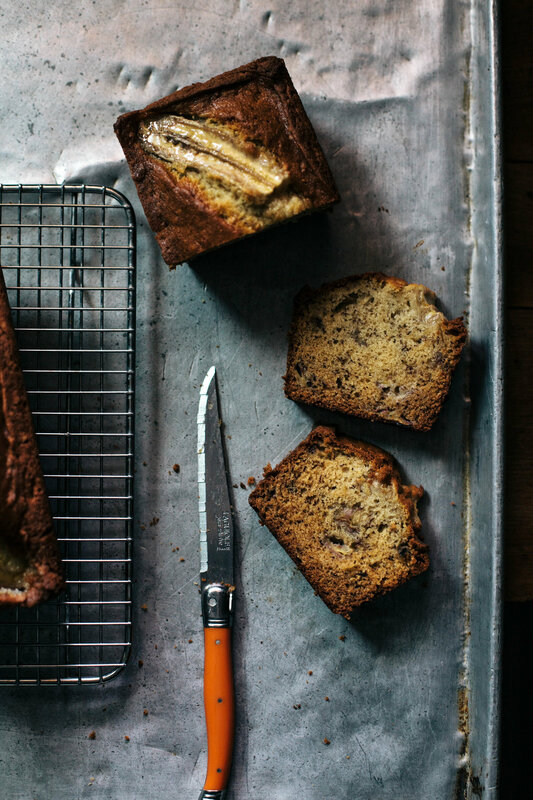 Banana Bread — always with butter. Start of a new year, in a new apartment, in the same city, without a job. It has become increasingly disheartening applying to job posting after posting, passing out resumes in person, only to still be out of luck. So I bake. As to not go stir crazy in this little apartment. Making things lately only from what I have on hand or that can be procured very cheaply. Any money spent is so tightly calculated as to be able to pay rent next month. So banana bread because there were bananas that were getting past their prime. I was actually waiting for them to get all the brown spots, just hoping that the boyfriend would forget to eat them. I hate bananas but love banana bread. The hate part just comes from the texture of a banana not the actual flavor. So mashed up and baked into a bread is the way I crave them. Oven 350F. Butter and flour pan. In a large bowl, whisk together the butter and sugar. Add in the eggs and whisk to combine. Next whisk in the milk and vanilla. In a separate bowl, sift the flour, baking soda and salt together. In another bowl, mash up 3 bananas. Now stir in the flour mix to the base until just combined. Then fold in the mashed up bananas until evenly distributed. Pour into the prepared pan. Slice the remaining banana lengthwise and place on top of the batter. Sprinkle just the banana with sugar so that it caramelizes while baking. Bake for approximately 50 minutes until center is set and sides are pulling away from the pan. Remove from pan and cool on a wire rack.